Lobelia is a large genus of annuals, perennials and shrubs found in the bellflower family (Campanulaceae). Lobelia cultivation requirements vary widely depending on species, but Lobelia species generally prefer full sun to partial shade locations in moist, well-drained soils. Lobelias do not tolerate drought. Upright flower stems bear spikes of bright, often tubular flowers. Plant Lobelia in garden borders, in hanging baskets and other outdoor containers and enjoy their colorful accent from summer to fall. Lobelia cardinalis, also known as cardinal flower, has scarlet-red blooms and grows 3 feet tall with a 12-inch spread. Cardinal flowers are hardy in USDA zones 3 through 10. 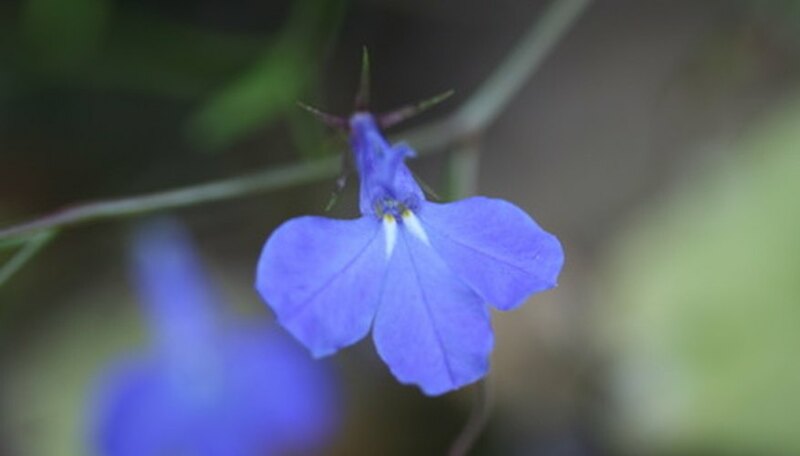 Lobelia erinus is often referred to as edging lobelia, garden lobelia or trailing lobelia and blooms in colors including blue, purple, red, pink or white. Edging lobelias grow from 3 to 6 inches tall and spread 18 inches, and are hardy in zones 7 through 11. Lobelia cultivar, Tania, has magenta blooms and grows 24 to 36 inches tall and spreads 12 inches. Grow Tania in zones 4 through 10. Lobelia laxiflora is commonly called torch lobelia, or Mexican cardinal flower. Its blooms are red and yellow. Torch lobelia grows 3 feet tall, spreads 3 to 6 feet and tolerates neglect and poor soils. Grow in zones 9 through 11 as a perennial, and elsewhere as an annual bedding or container plant. Lobelia siphilitica is also known as great blue lobelia, and grows 24 to 36 inches tall and 12 inches wide. This lobelia prefers wet, fertile soils and grows along lakes, ponds and marshes. Great blue lobelia grows in zones 5 through 10. Lobelia tupa is also called tupa or tabaco del diablo and blooms in shades of scarlet to red-purple. It reaches a height of 3 to 6 feet with a 36-inch spread. Grow tupa in USDA zones 8 through 10.